Accurately measuring evapotranspiration (ET) is important in the context of global atmospheric changes and for use with climate models. Direct ET measurement is costly to apply widely and local calibration and validation of ET models developed elsewhere improves confidence in ET derived from such models. This study sought to compare the performance of the Penman-Monteith-Leuning (PML) and Penman-Monteith-Palmer (PMP) ET models, over mesic grasslands in two study sites in South Africa. The study used routine meteorological data from a scientific-grade automatic weather station (AWS) to apply the PML and PMP models. The PML model was calibrated at one site and validated in both sites. On the other hand, the PMP model does not require calibration and hence it was validated in both sites. The models were validated using ET derived from a large aperture scintillometer (LAS). The PML model performed well at both sites with root mean square error (RMSE) within 20% of the mean daily observed ET (R2 of 0.83 to 0.91). Routine meteorological data were able to reproduce fluxes calculated using micrometeorological techniques and this increased the confidence in the use of data from sparsely distributed AWSs to derive reasonable ET values. The PML model was better able to simulate observed ET compared to the PMP model, since the former models both transpiration and soil evaporation (ES), while the latter only models transpiration. 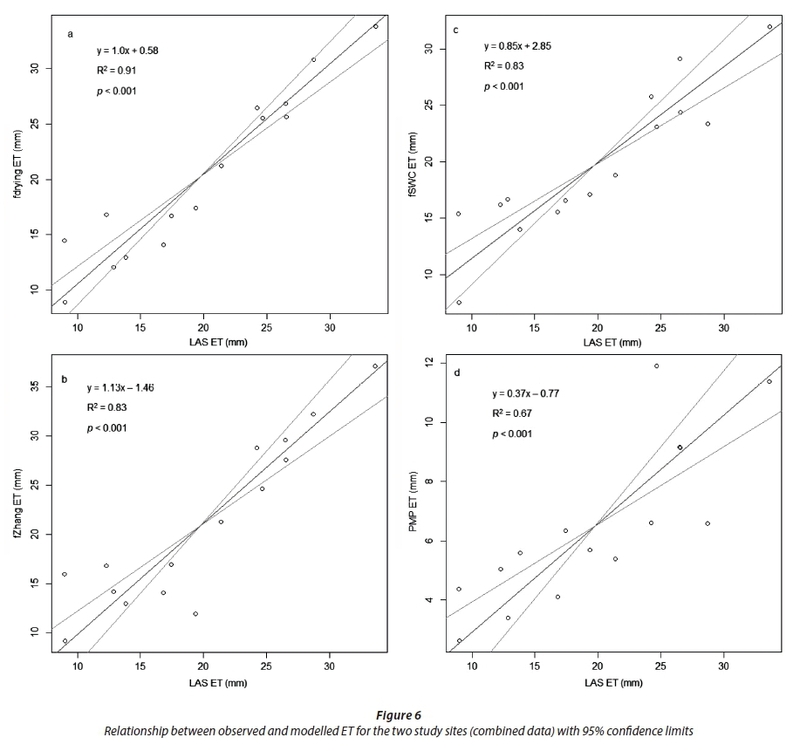 Hence, the PMP model systematically underestimated ET in a context where the leaf area index (LAI) was < 2.5. Model predictions in the grasslands could be improved by incorporating the ES component in the PMP model while the PML model could be improved by careful choice of the number of days to be used in the determination of the fraction of ES. Evapotranspiration (ET) or its energy equivalent, latent energy flux (LE), influences water availability and the partitioning of energy for a given landscape. An understanding of energy and water vapour fluxes over a particular landscape is crucial, especially in a context of validating climate change predictions. This will assist in the use of global change models and also improve the ability to monitor climate change consequences. However, ET is one of the least understood processes of the hydrological cycle, owing to the difficulties inherent in measuring it (Amatya et al., 2016). Recent developments in the form of eddy covariance systems and scintillometers have reduced uncertainties associated with measuring ET. Consequently, many studies have been carried out to evaluate the ability of models in reproducing observed ET (Fisher et al., 2008; Leuning et al., 2008; Mu et al., 2011; Morillas et al., 2013). These studies frequently combine ground-based routine meteorological data and remotely sensed data in developing models. In the developing world, long-term ET datasets from different vegetation physiognomic types are largely unavailable. In South Africa, the grassland biome comprises 27.9% of the total terrestrial surface of the country and is under pressure from land cover changes related to agriculture and settlement (Mucina et al., 2006). In recent decades the threat from woody invasive alien plants (IAPs) in the grassland biome has been recognised (Kotzé et al., 2010). It is believed that IAPs have a higher ET compared to indigenous species (Meijninger and Jarmain, 2014). Hence, it is critical to identify accurate ET models for grasslands affected by IAPs to improve estimation of ET. Micrometeorological techniques such as scintillometry are costly and this reduces their widespread adoption. At best these micrometeorological methods can be used to calibrate and validate models at a local scale. Most models have been developed elsewhere and have not been locally calibrated or validated, and application of such models remains a challenge due to a paucity of validation datasets. The availability of micrometeorological equipment in data-scarce areas is useful for locally calibrating and validating models to enable widespread applications with higher confidence levels. However, the application of micrometeorological methods is fraught with many challenges owing to the underlying theory and inherent errors (Savage, 2009; Rambikur and Chávez, 2014). A number of ET models have evolved, ranging from radiation, combination, energy balance and temperature-based algorithms (Mu et al., 2011; Liou and Kar, 2014; Zhang et al., 2016). The Penman-Monteith (PM) equation is one of the most theoretically robust ET models, which is essentially driven by routine meteorological data from weather stations (Fisher et al., 2008; Leuning et al., 2008). The PM equation evolved as a single layer potential ET model (Penman, 1948; Monteith, 1965), but recent efforts have enhanced it to also account for soil evaporation (Es). One of the recent formulations of the PM equation is the Penman-Monteith-Leuning (PML) equation (Leuning et al., 2008; Morillas et al., 2013). The biggest challenge in the implementation of the PML model is the determination of canopy conductance (Gc) and the fraction of soil evaporation (f). The f accounts for evaporation from a surface such as bare ground, while Gc influences transpiration. Evaporation from bare soil arguably follows three distinct stages, which include an initial period in which the soil is wet or saturated and ET occurs at or near to a potential rate (f = 1). This is followed by a second stage whereby soil is drying and the evaporation rate depends on soil characteristics, which may limit the movement of water into the surface (f < 1); and, lastly, dry soil in which the evaporation rate is negligible (f = 0) (Hulugalle et al., 2017). Based on this understanding, various algorithms have been developed to simulate soil drying so as to better determine Es (for example, Leuning et al., 2008; Mu et al., 2011; Morillas et al., 2013; Zhang et al., 2016). Therefore, proper determination of Gc and f is important in order for the model to be able to capture the soil drying process and to adequately account for ES. Other recent approaches of the PM equation connect reference ET (ET0) to actual ET by either using the leaf area index (LAI), vegetation indices (VIs) or crop coefficients (Kc) (Allen et al. 1998; Nagler et al., 2013; Palmer et al. 2014). Due to the robustness of the PM equation and data availability, this study adopted two recent models based on the original PM equation to compare their performance over a grassland area in South Africa. These models include the PML (Leuning et al., 2008; Morillas et al., 2013) and a method described by Palmer et al. (2014), herein called Penman-Monteith-Palmer (PMP). The main difference in the approaches is that the PMP model uses LAI as a scalar while the PML uses Gc and the f to constrain ET. The study used a large aperture scintillometer (LAS) to determine sensible energy flux and then applied the shortened energy balance method to derive LE. Subsequently, maximum stomatal conductance of leaves and the rate of soil drying were calibrated. 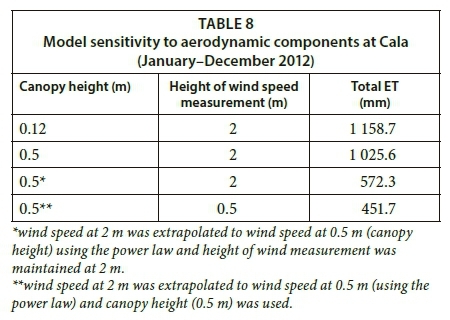 Sensitivity of the PML to wind speed at the canopy was also investigated. The novelty of this study was an assessment of sensitivity of the PML model to components of aerodynamic conductance in short canopies such as grasslands. 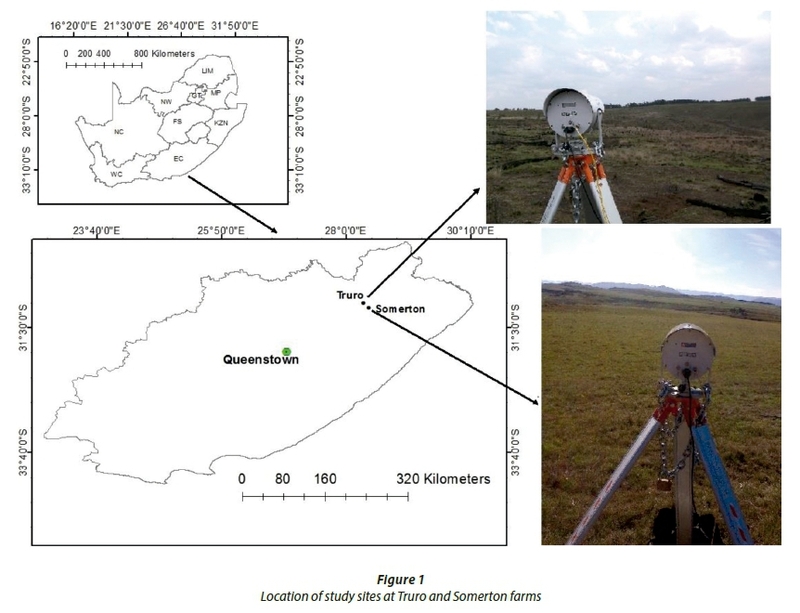 Finally, the PML and PMP models were validated over grasslands in the Eastern Cape. Validation of the ET models in data-scarce landscapes is important so that wide area ET can be derived in such regions with a higher degree of confidence. where the first part represents evaporation from the canopy and the second that from the soil, the terms Ac and As (MJ·m-2) are energy fluxes absorbed by the canopy and soil respectively, Gc is canopy conductance (m·s-1), λE is latent energy (MJ·m-2), f is a factor which modulates potential evaporation rate at the soil surface expressed by the equilibrium soil evaporation (Eeq,s) (Priestley and Taylor, 1972); where Eeq,s = ε As /ε +1), Da (kPa) is es(Ta)−ea, which is the water vapour pressure deficit (VPD) of the air, in which, es(Ta) is the saturation water vapour pressure at air temperature and ea is the actual water vapour pressure, Ga is the aerodynamic conductance (m·s-1), γ is the psychrometric constant (kPa·K-1), ρ is air density (1.2 kg·m-3), Cp is specific heat capacity of air (1 013 J kg-1·K-1), ε is slope (s) of the curve relating saturation water vapour pressure to temperature (kPa K-1) divided by γ, i.e. s/γ. The procedures described in Allen et al. (1998) were used to derive net radiation while As, Ac, Gc and Ga were obtained following Morillas et al. (2013). For daily calculation of ET, ground energy flux (G) was ignored as per the recommendations by Allen et al. (1998). 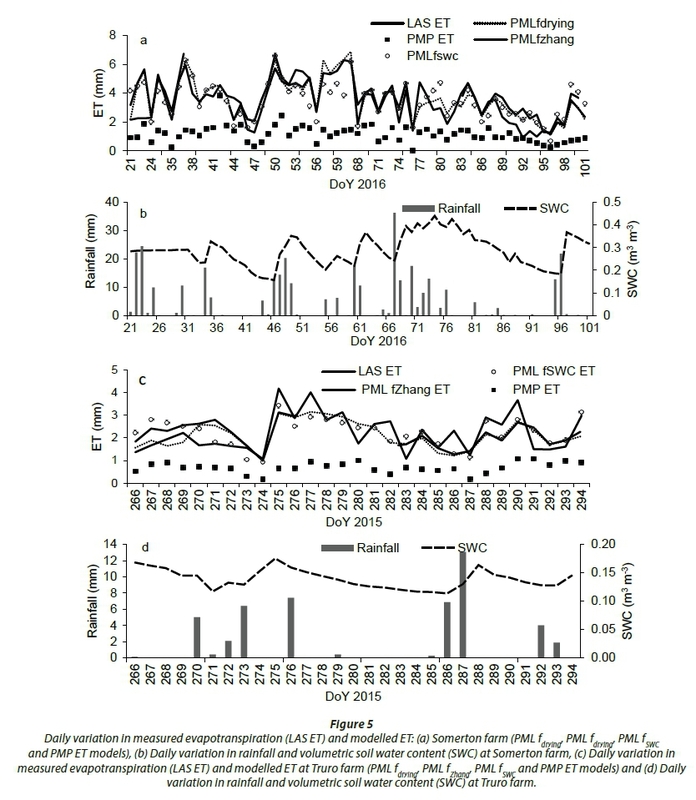 where LAImax is the site-specific long-term maximum LAI obtained from MOD15 product (Myneni et al., 2002), ET0 is short grass reference evapotranspiration calculated using Eq. 6 in Allen et al. (1998). where H, G and Rn are sensible, ground energy flux and net radiation, respectively. Two experimental sites were selected at Truro and Somerton farms in the northern Eastern Cape (Fig. 1), and micrometeorological measurements were collected using a LAS system. The study sites lie in the grassland biome (Mucina et al., 2006). A field campaign approach was adopted owing to logistical problems (Table 1). Both sites were exposed to moderate grazing by livestock. The first experimental site was at Truro farm. The site was cleared of Acacia mearnsii in 2005 and left to re-vegetate naturally. At this site, modelled annual pan evaporation and mean annual rainfall are 1 632 and 786 mm, respectively (Schulze, 1997). Post-clearing, the dominant grass species were Eragrostis curvula and Sporobolus africanus, with some pockets of Heteropogon contortus. Mean canopy height was estimated at 0.15 m after 10 physical measurements at different patches around the path length. Based on the line transect method (Flombaum and Sala, 2007), grass, bare soil, forbs and shrub canopy cover were estimated at 65, 24, 5 and 6%, respectively. The average terrain slope along the path length was 7.4% with a maximum slope of 18.8%. The altitude along the LAS path length ranged from 1 458-1 473 m amsl. At the Somerton site, pan evaporation is 1 686 mm per year and long-term mean annual rainfall is approximately 756 mm (Schulze, 1997). The LAS system was installed in a grazing camp and the dominant grass species was Themeda triandra. There was no evidence of any other form of historical disturbance (e.g. ploughing) in this camp, and it represented undisturbed native grassland in relatively good condition. At Somerton, the line transect method (Flombaum and Sala, 2007) estimated grass, bare soil, and forb canopy cover at 90, 8 and 2%, respectively. Average canopy height was 0.25 m and altitude ranged from 1 250-1 264 m amsl with an average slope of 0.4% along the LAS path. A large aperture scintillometer (LAS MkII, Kipp and Zonen B.V., Netherlands) was installed firstly at Truro and then at Somerton during the growing season of 2015/2016. This LAS is designed for measuring the path-averaged structure parameter of the Cn2 over horizontal path lengths from 250 m to 4.5 km and has a 0.149 m diameter (D) beam. The radiation source of the LAS MkII transmitter operates at a near-infrared wavelength of 850 nm. The scintillations measured by the instrument at this wavelength are caused by turbulent temperature fluctuations (Kipp and Zonen, 2012). At Truro farm a suitable patch of relatively homogenous rehabilitated grassland was found with a path length of 458 m, while at Somerton farm the path length was 355 m. Since the path lengths were less than 1 km, 0.1 m aperture diameter restrictors were fitted (Kipp and Zonen, 2012). The instrumental set-up was carefully arranged to ensure that the fetch comprised relatively homogenous grassland vegetation at both study sites. 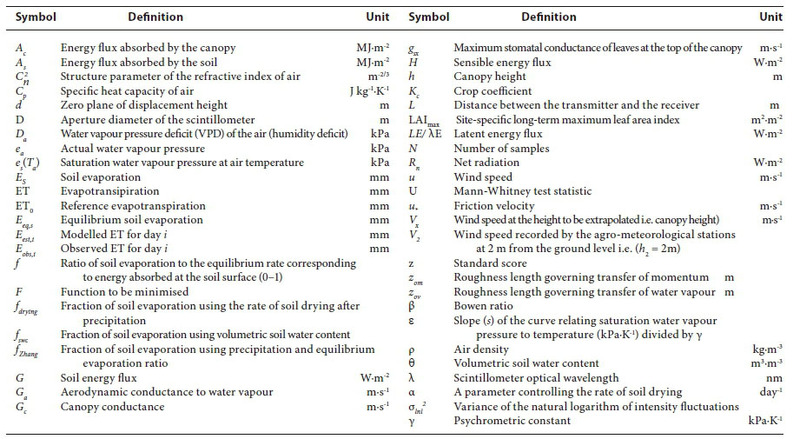 A micro-meteorological station was established at the LAS receiver to measure meteorological variables (Table 2). The LAS and micro-meteorological station sensors were connected to a Campbell Scientific CR3000 data logger for data recording. 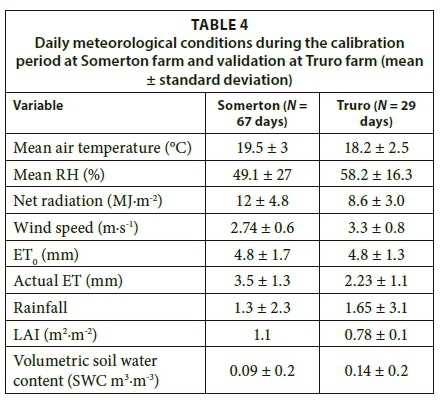 To determine the utility of sparsely distributed weather stations in modelling ET, independent meteorological data for running the models were obtained from an AWS (Table 3) located 500 m away from the experimental site at Somerton farm and the same weather station data was used to run the PML and PMP models at Truro farm located approximately 14 km away, It should be noted that in South Africa there is a paucity of validation datasets due to the unavailability of ET measurement equipment such as scintillometers on a wide scale. AWSs are more available, albeit sparsely distributed. Therefore, the use of completely independent datasets such as AWS in calibrating and running the ET models could be useful in a context of paucity in validation equipment. However, at the Truro site, the Tropical Applications of Meteorology Using Satellite Data and Ground-Based Observations (TAMSAT) rainfall data for Africa (Maidment et al., 2014; Tarnavsky et al., 2014) were used to drive the PML model, since there was no rainfall station close by. The Mann-Whitney test showed that the TAMSAT data at Somerton farm was similar to the observed rainfall from the AWS at the site (Mann-Whitney U = 3002, z = −1.08, N1 = N2 = 85, p > 0.05 two tailed), and subsequently the dataset was applied with a high degree of confidence. Three methods for determining f were applied. These included the fZhang (Zhang et al., 2010), fdrying and measured volumetric soil water content (fSWC) (Morillas et al., 2013). In order to successfully apply the fdrying approach, the CLIMWAT database (FAO, 2013) was used to determine daily effective precipitation, which was estimated at 1.65 mm for the study site. To successfully implement the fSWC approach, the minimum volumetric soil water content (θmin), was obtained from another study site at eZulu Game Reserve (Gwate et al., 2016), which had a longer soil moisture record including the driest months. This was assumed to be representative since the two sites have similar geology, namely Beaufort Series sandsones of the Karoo Supergroup (Mucina et al., 2006). The study used the LAI derived from MOD15A2 FPAR/LAI product (Myneni et al., 2002) to drive the PML model. Surface albedo was obtained from the MCD43B4 (Strahler and Muller, 1999) product by applying Liang's (2001) equation. The accuracy of the energy fluxes from a LAS is influenced by the mean height of its optical beam above the surface. EVATION (evapotranspiration) software program v2.5.0.11 (Kipp and Zonen B.V.) was used to determine effective LAS beam height following Hartogensis et al. (2003). 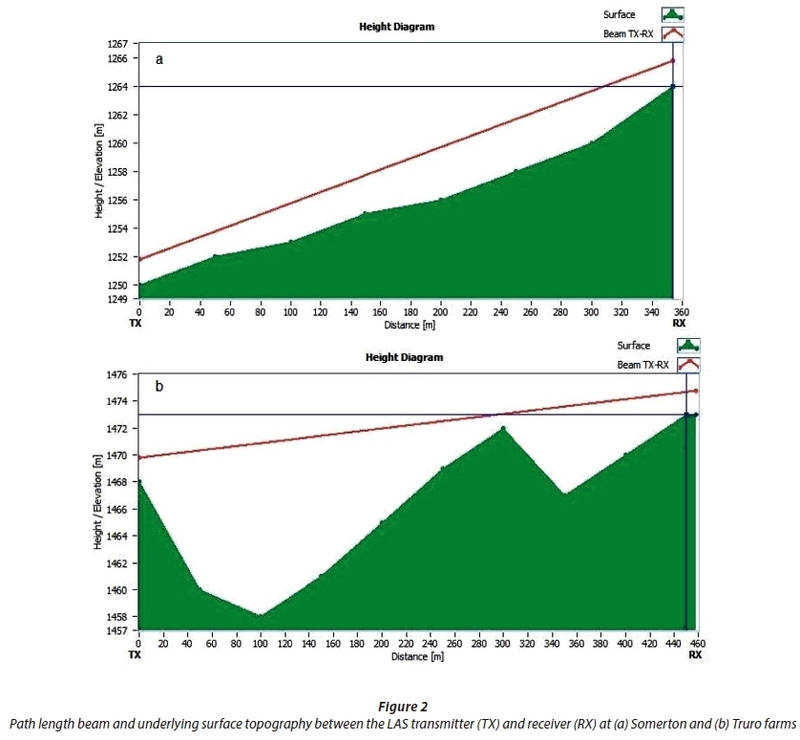 A slope profile along the path length was generated using elevation data from Google EarthPro and EVATION to derive effective height. A number of parameters in EVATION were configured before analysis could be carried out. These included selection of LAS Mk11, the momentum roughness length (zom) and the displacement height (d). 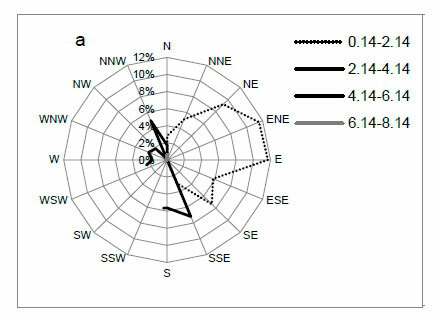 Vegetation height was estimated at different locations and times during the experiment in order to derive mean canopy height by measuring representative patches, with zom and d determined from the estimated canopy height (h) as 0.1 h and 0.66 h, respectively (Allen et al., 1998). Data were downloaded from the LAS and analysed using EVATION. The derived LE values were then converted into mm·h-1 to obtain ET. where D is the beam diameter (m), L is the pathlength (m) and λ is the scintillometer optical wavelength (nm) (Kohsiek et al., 2002; Bouin et al., 2012). where Eest,i is the modelled ET for day i, Eobs,i is observed ET for day i and N are the number of sample days. It should be noted that due to logistical challenges, which did not allow for a long time period of measurements at the Truro site, the PML model was validated using gsx and α values obtained from the Somerton site. The two sites are 14 km apart and have similar soils and vegetation type (Mucina et al., 2006). At the Somerton site, a leaf porometer (Decagon Devices, US/ Canada) was used to measure stomatal conductance at a leaf scale and this assisted in comparing measured and optimised stomatal conductance values. The measurements were conducted on a week-long field campaign in the morning (08:00-10:00), midday (12:00-14:00) and late afternoon (15:00-16:30). The PML and PMP models were then evaluated using the measured LAS ET data. The validation period spanned from DoY 21 to 104, 2016, for both models. Model performance was evaluated using the root mean square error (RMSE) and both the systematic and unsystematic (Willmott, 1981) components are reported. The study also reports the RMSE-observations standard deviation ratio (RSR), which gives a measure of what is considered a low RMSE (Moriasi et al., 2007). The mean absolute error (MAE), which is less sensitive to extreme values than RMSE, is also reported as well as the per cent bias (PBIAS), to give insights into the tendency of models to over- or underestimate the fluxes. The linear regression between the observed and modelled ET was also assessed. Model II simple linear regression using the standard major axis (SMA) method in R statistical software environment (R-3.1.3) was performed. This was found suitable for the study since the two variables of interest were amenable to measurement error (Legendre, 2013). The coefficient of determination (R2) the slope and y-intercepts were also investigated and reported. The sensitivity of the PML to the aerodynamic components was assessed using a complete year (2012) of data over the grassland at Cala, near the present study sites. This was achieved by varying the canopy height, height of wind speed measurement and by extrapolating wind speed measured at 2 m down to the canopy height by applying Eq. 5. Differences in the estimated ET were then recorded for comparison purposes. The effective scintillometer beam height (ZLAS) at Truro was 3.83 m while at Somerton it was 3.05 m (Fig. 2). A total of 39% of the data at Somerton farm was lost, mainly due to misalignment of the unit resulting in no or lower signal strength (Udemond < 10 mV) and a lower Cn2 of 10-17 (m-2/3) or no number. With respect to Truro farm, 29% of the data were rejected due to misalignment of the system. The misalignment was mainly caused by animals, which occasionally interfered with the system. Of the available data, 7% and 35% of hourly fluxes were filtered out due to failure to pass quality control flags in Truro and Somerton sites, respectively. Based on Eq. 7, LAS saturation would start at Cn2> 1.85498 × 10-9 and 9.3334 × 10-10 at the Truro and Somerton sites, respectively. However, the study did not detect any saturation at either of the sites. Meteorological conditions differed at the study sites (Table 4). 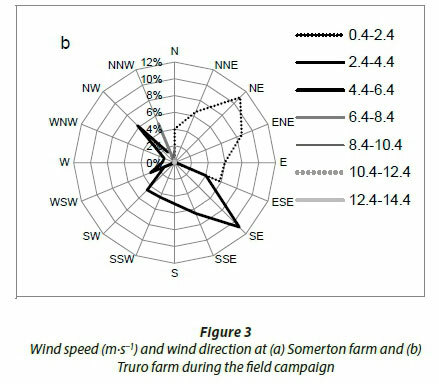 With respect to the Somerton site, the prevailing wind was from between the ENE and E sector (24%, Fig. 3a). At the Truro site, the prevailing winds were from the SE and NE direction (Fig. 3b). At both sites, the ET pattern followed that of SWC and ET0 was consistently higher than actual ET (Fig. 4). The optimised gsx was similar for the different parameterisation approaches of the PML model and the α was relatively low (Table 5). The measured highest stomatal conductance at the leaf level was 0.0025 m·s-1. All the PML approaches yielded RMSE that was within 15% of the daily observed ET at Somerton farm (Table 6). The average observed ET during validation was (3.5 ± 1.3) mm·day-1. The fdrying approach yielded a better model fit while the fZhang performed poorly compared to the other approaches of the PML (Table 6). The fdrying and fZhang approaches tended to overestimate the observed ET. However, the fSWC approach and the PMP model tended to underestimate the measured ET, as shown by the PBIAS (Table 6). The PMP model had a RMSE of 1.76 mm·day-1 and PBIAS of 67%. 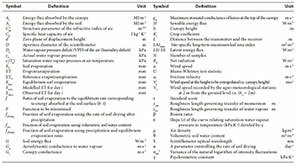 Most of the RMSE was unsystematic for the two models (Table 6). The MAE for the PML lay between 5 and 10% of the observed daily mean ET while that of the PMP model was 50% of the observed mean ET (Table 6). The lowest RMSE was obtained with the fSWC approach and the highest with fdrying (Table 6). The PMP and the PML model's fdrying approach tended to underestimate observed ET (Table 7). With respect to the PMP model and the fSWC approach, the RMSE was essentially systematic, while it was unsystematic for the fdrying and fZhang approaches (Table 7). The average measured daily ET during the validation period was (2.2 ± 0.9) mm and the RMSE for the PML approaches was within 20% of the observed daily ET (Table 7). The PML model tended to overestimate ET after rainfall events (Fig. 5). The SWC followed the rainfall pattern at both sites (Fig. 5). Data from the two sites were combined and regression equations of the modelled ET against observed ET were developed for each site by summing up 8-day ET (N = 15, 8-day periods) in line with the availability of the MODIS LAI. Large regression slopes were obtained using the fdrying and fZhang approaches (Fig. 6a-b). The fZhang and the fSWC approaches had similar R2 although their slopes were different (Fig. 6b-c). The lowest R2 and slope were observed from the PMP model (Fig. 6d). Canopy height, wind speed and height of wind speed measurement help to define Ga. It was shown that variation in these Ga components has serious consequences to the PML modelled ET (Table 8). Good quality data are crucial for model calibration and validation. The study applied well-established and rigorous data quality control protocols in order to accurately derive fluxes (Campbell Scientific, 2005; Bouin et al., 2012; Rambikur and Chávez, 2014) and this helped to reduce uncertainties in the calculated ET. The good performance of the PML model on the Truro farm, where only validation was done using calibrated values of α and gsx from the Somerton site, suggests that the obtained values could be accurate given that environmental conditions also differed during the calibration and validation periods. Although there were isolated high pulses of ET, generally the atmospheric demand for moisture was high at the sites as ET was less than ET0 for most of the time, suggesting that the areas were water limited. The estimated values of gsx were similar for the three approaches for parameterising conductance, indicating convergence in the methods. The gsx values were slightly lower than the optimised values obtained by Leuning et al. (2008) in Kendall, USA, who obtained a value of 0.0048 m·s-1 over a grassland, but the observed values were within the limits reported by Kelliher et al. (1995). The highest measured stomatal conductance value obtained was 0.0025 m·s-1. It is well established that the dominant species at Somerton (Themeda trianda) and at Truro farm (E. curvula) have evolved to survive in semi-arid areas by reducing stomatal conductance in order to optimise water use (Snyman et al., 2013; Favaretto et al., 2015). In addition, C4 grasses similar to those at the study sites have relatively small stomata, regardless of density, resulting in a lower maximum stomatal conductance to water vapour (Liu and Osborne, 2014). Hence, a combination of these factors and the size of the crop (0.15-0.25 m) could explain the relatively low optimised gsx. The α was low (0.1) and this may be reflective of relatively high SWC. The fdrying approach outperformed the other PML approaches and the PMP model in reproducing ET dynamics. However, the slight over-prediction by the fdrying approach was due to the higher f values considered by the model, probably due to relatively high precipitation during the validation period at the Somerton site. There were only a few rainy days during validation at Truro, resulting in lower f values and hence the slight underestimation by the model at this site. This is also true with respect to the fZhang approach, although it still overestimated ET at the Truro farm site. This was consistent with Morillas et al. (2013) who also observed that, when applied on a daily interval, the fZhang approach tended to over-predict ET, especially after rainfall events. Zhang et al. (2016) also reported slight overestimation of ET by the fZhang PML approach. The performance of the fZhang approach suggests that it is a robust method and could reduce the number of parameters needed in the PML model. 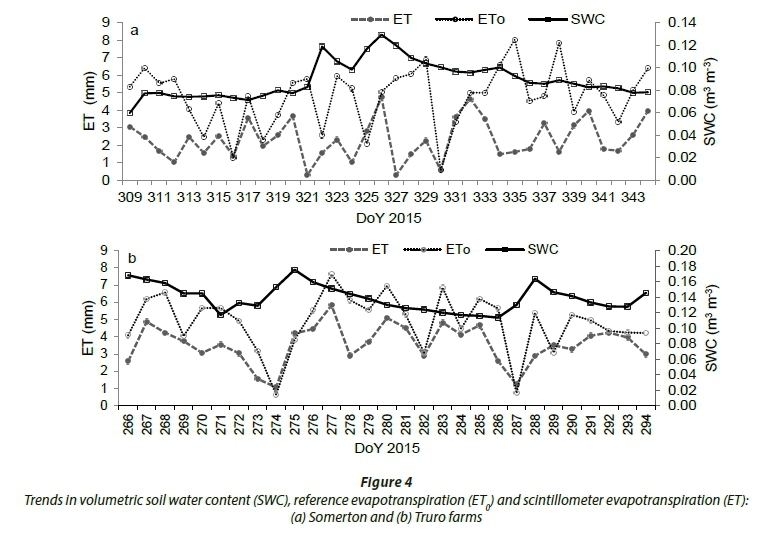 The slight underestimation of ET by the fSWC at Somerton farm could be linked to errors associated with rescaling volumetric soil water content to f values. With respect to the three approaches of the PML, most of the RMSE was unsystematic and this is a hallmark of robust models (Willmott 1981; Leuning et al. 2008). Overall, the RMSE and MAE for the different PML approaches were significantly lower, relative to mean daily measured ET, and this suggests that the model was quite robust. Morillas et al. (2013) found R2 of 0.24-0.59 using different approaches of the PML while this study obtained higher R2 results. Although α was kept constant, reasonably good results were still obtained. It should be noted that in reality α is dynamic since it is influenced by changing environmental conditions (Morillas et al., 2013). The poor performance by the PMP model shows that scaling ET0 to actual ET through MODIS LAI may not be adequate in areas with low LAI. It is well established that at low LAI (< 2.5), Es could be as high as 80% of the total flux (Morillas et al., 2013). In addition, short canopies may not be effective in attenuating energy through the canopy to the soil surface and this could have resulted in high As to drive Es. The LAI in the study area was < 2 and as such the PMP model could not capture the dynamics in ET. Hence, the model systematically underestimated ET owing to the low scaling factor. It should be noted that the MODIS LAI product is only provided every 8 days yet the grassland responds very rapidly to rain events, and the delay in acquiring the latest LAI after the first rain events would have meant that, in the first days of validation, model predictions were compromised. Given that the PMP is a parsimonious model forced by readily available data, it is prudent to incorporate Es in the formulation in order to improve ET estimation. However, Palmer et al. (2014) found a good model fit using the PMP model in a semi-arid savanna of South Africa; hence, vegetation physiognomic structure could explain the disparity in results. When applying the PML it is important to accurately determine aerodynamic components as shown by sensitivity analysis of the model over the grassland. Results suggest that over short canopies, ET can easily be over-estimated if wind speed at the reference height is used. High wind speed was recorded at the reference height of 2 m compared to the actual wind speed at the canopy. The increase in the height of wind speed measurement, results in an increase in the modelled ET. Hence, in areas characterised by short vegetation such as grassland, the estimation of the wind speed at the canopy height is crucial in order to derive accurate fluxes. The study compared the performance of the PML and PMP models against ET derived from a LAS over grasslands. Based on the model evaluation metrics, the PML performed better than the PMP model. Hence, the calibrated values may be applied across grasslands in South Africa with reasonable confidence. The good performance by the fZhang approach was encouraging since the PML can now be applied using data that is readily available, with only gsx as a model parameter to be determined. Routine meteorological data were able to reproduce fluxes calculated using micrometeorological methods over this grassland. This means sparsely distributed weather stations can confidently be used to derive reasonable ET over wide areas, as the validation exercise revealed. Determining accurate wind speed at the canopy height is crucial when working in short vegetation in order to derive reasonable ET estimates using the PML model. The inadequacy of the PMP model to simulate observed ET in the study area confirmed the importance of Es in such environments and, therefore, the PMP model could be improved by adding a Es component. This work was supported by the South African Water Research Commission, as part of Project No. K5/2400/4, and the National Research Foundation through the National Equipment Fund. Special thanks go to the Du Pleis and Trollop families who allowed the project team to install equipment on their properties.